India’s Defense Minister Nirmala Sitharaman was accorded red carpet welcome during her five-day maiden trip to the US that concluded Friday with her visit to the Indo-Pacific Command in Hawaii. The trip did not result in any major announcements nor did the US said anything on its pending decision on the punitive CAATSA Sanctions for New Delhi buying S-400 missile security system from Russia. The trip, Sitharaman told reporters at the Pentagon on the first day of her visit was part of her endeavor to take forward the bilateral defense cooperation further. “A strong foundation has been made for the India-US defense relations over the years. India sees the U.S. as an important partner in defense. We have good military-to-military cooperation, defense consultations, scientific and R&D work, defense trade, co-production and co-development, and industry collaboration,” she said. Arriving at the Pentagon after she laid wreath at the tomb of the unknown soldiers at the Arlington National Cemetery, Sitharaman leading a high-powered Indian delegation said that she is in the US to accord greater momentum to the dialog and partnership between the two countries. “Our bilateral relationship continues to be very strong. Several high-level engagements, including Prime Minister Narendra Modi’s meeting with Vice President Pence, in Singapore and on the margins of the East Asian summit have underscored our mutual desire to move positively and quickly,” she said. “Regular high-level exchanges help in steering the relationship forward. They are an indication of the depth and quality of our bilateral partnership, as well as our mutual desire to work closely on a range of bilateral and global issues,” said the defense minister as she met the US Defense Secretary James Mattis for the fourth time in a year. In that time, Mattis said the two countries have made meaningful progress advancing US-India defense cooperation. The inaugural 2+2 Ministerial Dialogue in New Delhi he said served as a tangible demonstration of their shared vision for a safe, secure, prosperous and free Indo-Pacific, underpinned by respect for the sovereignty and the territorial integrity of all nations. “Today, I reiterate U.S. appreciation for India’s leadership as a stabilizing force in pursuit of that vision, promoting peace and security across the region and the globe. The 2+2 Ministerial also made clear our commitment to further bolster our major defense partnership. Today, we build on that momentum, as we work to implement our agreements from September, including our Communications Compatibility and Security Agreement,” said Mattis, who also hosted Sitharaman for a dinner later in the evening. Before landing in Hawaii, the headquarters of the US INDO PACOM headquarters, Sitharaman traveled to San Francisco to have interaction with the think tank community at the Stanford University and visit the Defense innovation Unit so as to have the first hand experience of the ecosystem of startups in the US and what are the best practices that India can learn from here. In Hawaii, she was hoisted by United States Indo-Pacific Command (USINDOPACOM) Commander, Adm. Phil Davidson. “Our two democratic nations are committed to upholding a rules-based international order, which has brought decades of peace, stability, and prosperity. We are global partners on defense and security and this exemplifies our mutual cooperation to assure a Free and Open Indo-Pacific,” he said. 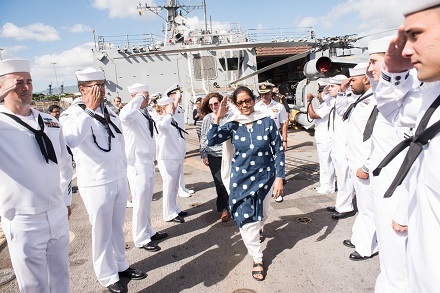 After her meeting with Davidson, Sitharaman was given a tour of the USS Michael Murphy (DDG 112) and an afternoon barge tour of historic Pearl Harbor also hosted by Adm. Davidson. The United States and India have been major defense partners since 2016, a partnership that was reinforced by the inaugural U.S.-India 2+2 Ministerial Dialogue in New Delhi this past September, which included the signing of the Communications Compatibility and Security Agreement. This partnership is a reflection of the increasing strategic importance of the U.S.-India security relationship and the significant progress both countries have made in advancing their defense cooperation. The opportunities for mutual coordination and collaboration in the Indo-Pacific region continue to grow, USINDOPACOM said. 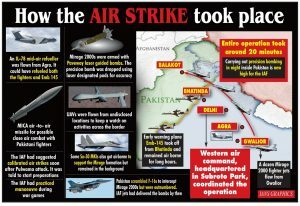 Air forces of India and the US are currently conducting a 12-day military exercise in Kalaikunda and Panagarh air bases in West Bengal, with an aim to enhance operational coordination, according to India Air Forces officials. The ‘Ex Cope India-18’ will be the fourth edition in the series of bilateral drills between the Indian Air Force and the US Air Force.